A 3.3 oz bar of goat milk soap lavender patchouli. Option with a brown oval soap lift. Happy goats living in Talkeetna just up the road from Anchorage provide fresh milk for these special moisturizing soaps. Milk has long been known as a skin softener and when put into soaps you will experience a rich and creamy soap that your skin will love. 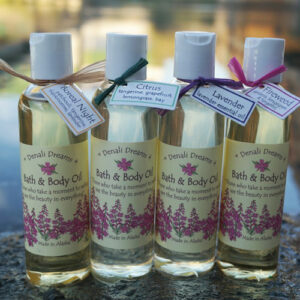 Scented with pure essential oils of lavender and patchouli.